Slyde is a Canadian quartet playing modern progressive rock. In the past, they have released two EPs, both conceptual in nature with themes regarding the earth, environmentalism, and the human condition. 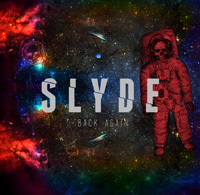 Being consistent once more, Slyde returns with their third concept EP, Back Again, with similar themes, but also with integration of an alien visitation, or better, observation. They're not happy with us. Generally, Slyde's progressive music turns on neo-classical underpinnings twisted with modern nuances. For the former, melody and harmony are not forgotten, neither is intrigue in arrangements and instrumentation. Solos from synths and guitar offer both interest and playfulness. Some may find the synths to be tinkering with old video game vibes. Additionally, guitarist Nathan Da Silva sings clean and melodic. But with the slight effeminate timbre of his voice, you might think keyboard player Sarah Westbrook is actually the lead vocalist. To the latter modern nuances, Slyde pursues more assertive and heavier riffage, and also more aggressive pacing, notable in Fading and Divide. 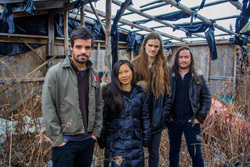 To say something more about the songs, Join The Parade juxtaposes some of that assertive riffage with a smooth layer of keyboards and pop rock sensibility from a bouncing bass line. It might be the most "progish" song here. Alternatively, the title cut, Back Again, is driven mostly by melody and groove formed by the piano line, rhythm section, and vocal arrangement, notably the chorus. Essentially, it's a prog song in an AOR wrapper. Not having heard Slyde's previous EP, I wasn't sure what to expect. Suffice to say, with Back Again, Slyde is merely re-imagining classic progressive rock for the modern age. Both fans of Rush and Coheed and Cambria will enjoy this EP.